Hi everyone! Hope you are all doing great. I arrived in Punta Cana after a delay due to airline logistics. I am however super excited and ready for the warm beaches. How was your weekend? On Friday, I attended a friend’s Yoruba traditional wedding. It was a beautiful and lovely wedding and I was surprised I did not get tired. I could not resist dancing to the music and the melodies of the talking drums. I also enjoyed the company of my friends that attended the event. I posted a glimpse of the event on my Vine channel. The outfit in this post reminds me of the Zara print pair that I wore here. I love mixing and pairing prints. The H&M prints ensemble was just fun and comfortable. 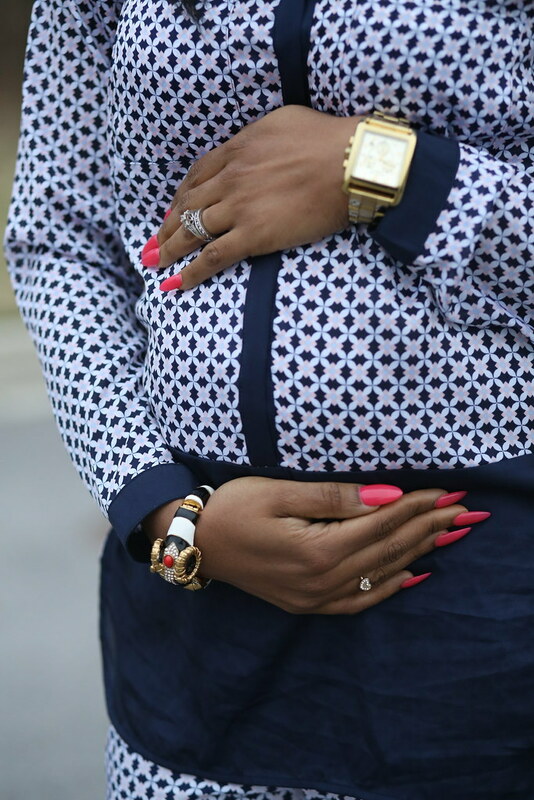 I love the tunic top, which gives my bump lots of breathing room. Rather than wearing black or beige pumps, I went with a more colorful one to brighten my day. I also changed my lipstick to NARS Schiap (pink) and it has become one of my favorite pink lipsticks. Super cute outfit! The pink lip looks amazing on you! very nice combination! Well, that shoes contrasting yellow! Such a pretty pregnant lady! Love it! beautiful as usual stella ! I love the look and the colour of your shoes, you look great. Aww,this is lovely! those heels stole my heart!! You look amazing love your look fabulous! Punta Cana is a lovely relaxing place, hope you enjoy your vacation. You look great in this set. Navy & mustard yellow; what a great idea!I have mustard yellow suede pumps from Urban Outfitters, so now, I know what to pair them with. Thanks! Super doper cute and lovely outfit. You are so stylish! I love the color of your shoes! you are so lucky that you are in Dominican Republic, I love it there. What a cute look...and your baby bump is the best accessory. Enjoy Punta Cana.